In Hong Kong and Me, May Chan uses food as a mnemonic bridge to her personal history. 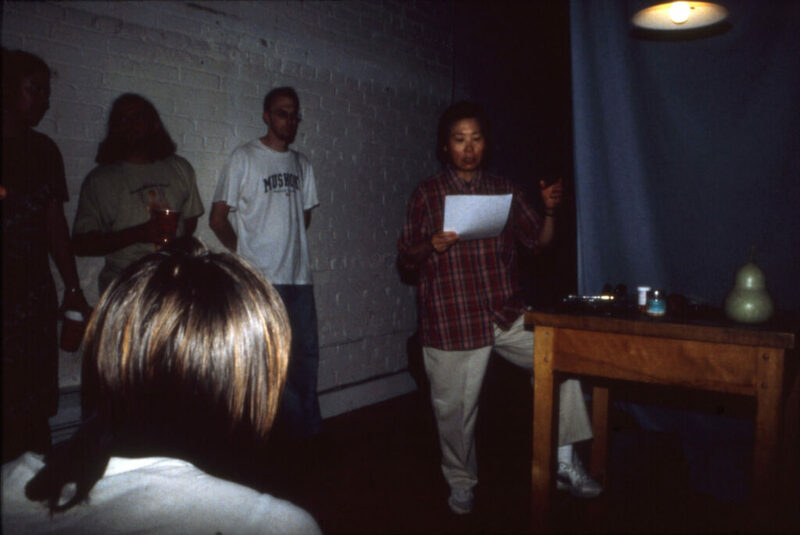 Her performance art pieces, presented in a friendly, understated manner, mix poetry, diary stories, simple actions and cooking to provide a richly expressive sense of her life as a Hong Kong-born Canadian immigrant. May Chan lives in Kingston and works as a visual artist, writer and performance artist. Her work is characterized by a steadfast, careful observation of everyday details and a keen eye for the expressive elements of personal history, which she uses to bring the audience into her way of perceiving. She has presented work extensively in Canadian artist-run centres over the past 15 years, and was featured in the Touched section of last year’s 7a*11d festival. My performance is about Chinese culture, about being a woman, and about living. I use sound, action and reading poem-stories. I deal with sense of touch abstractly, more in the sense of keeping in touch. Paul Simon sings, “Touch the sound of silence.” Part of the performance is about food and cooking. I come from Hong Kong, close to Canton in Southern China. Canton is famous for its cooking. For people in Canton, cooking (eating) is important. Their sense of taste is well developed. Their art is their dishes of food. Their art galleries are their restaurants. I keep in touch with my background — food. May Chan lives in Kingston and works as a visual artist, writer and performance artist. Her work is characterized by a steadfast, careful observation of everyday details and a keen eye for the expressive elements of personal history, which she uses to bring the audience into her way of perceiving. She has presented work extensively in artist-run centres over the past 15 years, using reading, performance actions, exercise and cooking to trace the physical and visceral rituals that keep her ‘in touch’ with her own history and ancestry.